Louis Farrakhan Sr. (/ˈfɑːrəkɑːn/; born Louis Eugene Walcott; May 11, 1933), formerly known as Louis X, is an American black nationalist and minister who is the leader of the religious group Nation of Islam (NOI). Previously, he served as the minister of mosques in Boston and Harlem and had been appointed National Representative of the Nation of Islam by former NOI leader Elijah Muhammad. After Warith Deen Muhammad disbanded the NOI and started the orthodox Islamic group American Society of Muslims, Farrakhan started rebuilding the NOI. In 1981 he renamed his organization from Final Call to the Nation of Islam, reviving the group and establishing its headquarters at Mosque Maryam. Farrakhan has been described as antisemitic by the Southern Poverty Law Center, the Anti-Defamation League and others. The NOI promotes an anti-white theology, also according to the SPLC. Some of his remarks have also been considered homophobic. Farrakhan has disputed these characterizations. In October 1995, he organized and led the Million Man March in Washington, D.C. Due to health issues, he reduced his responsibilities with the NOI in 2007. However, Farrakhan has continued to deliver sermons and speak at NOI events. In 2015, he led the 20th Anniversary of the Million Man March: Justice or Else. Farrakhan was born Louis Eugene Walcott in The Bronx, New York, the younger of two sons of Sarah Mae Manning (January 16, 1900 – November 18, 1988) and Percival Clark, immigrants from the Caribbean islands. His mother was born in Saint Kitts and Nevis. His father was Jamaican. The couple split before Louis was born. Farrakhan says he never knew his biological father. In a 1996 interview with Henry Louis Gates Jr., he speculated that his father, "Gene", may have been Jewish. After his parents separated, his mother moved in with Louis Walcott from Barbados, who became his stepfather. After Louis' stepfather died in 1936, the Walcott family moved to Boston, Massachusetts, where they settled in the West Indian neighborhood of Roxbury. Starting at the age of six, Walcott received training in the violin. He received his first violin at the age of six, and by the time he was 13 years old he had played with the Boston College Orchestra and the Boston Civic Symphony. A year later, he went on to win national competitions. In 1946, he was one of the first black performers to appear on the Ted Mack Original Amateur Hour, where he also won an award. He and his family were active members of the Episcopal St. Cyprian's Church in Roxbury. Walcott attended the Boston Latin School, and later the English High School, from which he graduated. He completed three years at Winston-Salem Teachers College, where he had a track scholarship. Walcott married Betsy Ross while he was in college. In 1955, both of them joined the Nation of Islam. Later, she took the name Khadijah Farrakhan. She lived in Boston,[when?] and was pregnant with their child. Due to complications from the pregnancy, Walcott dropped out after completing his junior year of college to devote time to her and their child. They are still married. Farrakhan has nine children: four sons: Mustapha, Joshua Nasir, Abnar, and Louis Jr., and five daughters: Donna, Hanan, Maria, Fatimah, and Khallada. In the 1950s, Walcott started his professional music career by recording several calypso albums as a singer under the name "The Charmer." He also performed on tour. In February 1955, using part of his middle name, Eugene, "Calypso Gene" was headlining a show in Chicago, Illinois, entitled "Calypso Follies." One of his songs was on the top 100 Billboard Chart for five years in a row. There he first came in contact with the teachings of the Nation of Islam (NOI) through Rodney Smith, a friend and saxophonist from Boston. Walcott and his wife Betsy were invited to the Nation of Islam's annual Saviours' Day address by Elijah Muhammad. Prior to going to Saviours' Day, due to then-Minister Malcolm X's media presence, Walcott had never heard of Elijah Muhammad, and like many outside of the Nation of Islam, he thought that Malcolm X was the leader of the Nation of Islam. In 1955, Walcott fulfilled the requirements to be a registered Muslim/registered believer/registered laborer. He memorized and recited verbatim the 10 questions and answers of the NOI's Student Enrollment. He then wrote a Saviour's Letter that must be sent to the NOI's headquarters in Chicago. The Saviour's Letter must be copied verbatim, and have the identical handwriting of the Nation of Islam's founder, Wallace Fard Muhammad. After having the Saviour's Letter reviewed, and approved by the NOI's headquarters in Chicago in July 1955, Walcott received a letter of approval from the Nation of Islam acknowledging his official membership as a registered Muslim/registered believer/registered laborer in the NOI. As a result, he received his "X." The "X" was considered a placeholder, used to indicate that Nation of Islam members' original African family names had been lost. They acknowledged that European surnames were slave names, assigned by the slaveowners to mark their ownership. Members of the NOI used the "X" while waiting for their Islamic names, which some NOI members received later in their conversion. Hence, Louis Walcott became Louis X. Elijah Muhammad then replaced his "X" with the "holy name" Farrakhan, an Arabic name meaning "The Criterion". The summer after Louis' conversion, Elijah Muhammad stated that all musicians in the NOI had to choose between music and the Nation of Islam. Louis X did so only after performing one final event at the Nevele, a Jewish resort in the Catskills. After nine months of being a registered Muslim in the NOI and a member of Muhammad's Temple of Islam in Boston, where Malcolm X was the minister, the former calypso-singer turned Muslim became his assistant minister. Eventually he became the official minister after Elijah Muhammad transferred Malcolm X to Muhammad's Temple of Islam No. 7 on West 116th St. in Harlem, New York City. Louis X continued to be mentored by Malcolm X, until the latter's assassination in 1965. The day that Malcolm X died in Harlem, Farrakhan happened to be in Newark, New Jersey on rotation, 45 minutes away from where Malcolm X was assassinated. After Malcolm X's death, Elijah Muhammad appointed Farrakhan to the two prominent positions that Malcolm held before being dismissed from the NOI. Farrakhan became the national spokesman/national representative of the NOI and was appointed minister of the influential Harlem Mosque (Temple), where he served until 1975. Farrakhan made numerous incendiary statements about Malcolm X, contributing to what was called a "climate of vilification." Three men from a Newark, NOI mosque—Thomas Hagan, Muhammad Abdul Aziz (aka Norman 3X Butler) and Kahlil Islam (aka Thomas 15X Johnson)—were convicted of the killing and served prison sentences. Only Hagan ever admitted his role. Warith Deen Mohammed, the seventh son of Elijah and Clara Muhammad, was declared the new leader of the Nation of Islam at the annual Saviours' Day Convention in February 1975, a day after his father died. He made substantial changes to the organization in the late 1970s, taking most members into a closer relationship with traditional (orthodox) Islam, and renaming the group "World Community of Islam in the West", and eventually the American Society of Muslims, to indicate the apparent change. He rejected the deification of the founder Wallace D. Fard as Allah in person, the Mahdi of the Holy Qur'an and the messiah of the Bible, welcomed white worshipers who were once considered devils and enemies in the NOI as equal brothers, sisters, and friends. At the beginning of these changes, Chief Min. Warith Deen Mohammed gave some Euro-Americans X's, and extended efforts at inter-religious cooperation and outreach to Christians and Jews. Changing his position and title from Chief Minister Wallace Muhammad to Imam Warith Huddin Mohammad, and finally Imam Warith Al-Deen Mohammed, he was responsible for the conversion of over 2,000,000 members of the Nation of Islam to traditional Islam in the United States of America. Farrakhan joined and followed Imam Warith Al-Deen Mohammed, and eventually became a Sunni Imam under him for ​3 1⁄2 years from 1975–1978. 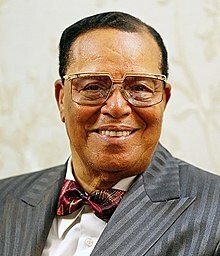 Imam Mohammed gave Imam Farrakhan the name Abdul-Haleem. In 1978, Imam Farrakhan distanced himself from Mohammed's movement. In a 1990 interview with Emerge magazine, Farrakhan said that he had become disillusioned and decided to "quietly walk away" rather than cause a schism among the members. In 1978, Farrakhan and a small number of supporters decided to rebuild what they considered the original Nation of Islam upon the foundations established by Wallace Fard Muhammad, and Elijah Muhammad. This was done without publicly stating the intent. In 1979, Farrakhan's group founded a weekly newspaper entitled The Final Call, Inc. intended to be similar to the original Muhammad Speaks Newspaper that Malcolm X claimed to have started, in which Farrakhan had a weekly column. In 1981, Farrakhan and his supporters held their first Saviours' Day convention in Chicago, Illinois, and took back the name of the Nation of Islam. The event was similar to the earlier Nation's celebrations, last held in Chicago on February 26, 1975. At the convention's keynote address, Farrakhan announced his attempt to restore the Nation of Islam under Elijah Muhammad's teachings. In 1985, Farrakhan obtained working capital in the amount of $5 million, in the form of an interest-free loan from Libya's Islamic Call Society. Libyan President Muammar Gaddafi had also offered Farrahkan guns to begin a black nation. Farrakhan said that he told Gaddafi that he preferred an economic investment in black America. On October 24, 1989, at a press conference at the J.W. Marriott Hotel in Washington, DC, Minister Farrakhan described a vision which he had on September 17, 1985 in Tepoztlán, Mexico. In this 'Vision-like' experience he was carried up to "a Wheel, or what you call an unidentified flying object", as in the Bible's Book of Ezekiel. During this experience, he heard the voice of Elijah Muhammad, the leader of the Nation of Islam. He said in the press conference that Elijah Muhammad "spoke in short cryptic sentences and as he spoke a scroll full of cursive writing rolled down in front of my eyes, but it was a projection of what was being written in my mind. As I attempted to read the cursive writing, which was in English, the scroll disappeared and the Honorable Elijah Muhammad began to speak to me." [Elijah Muhammad said], "President Reagan has met with the Joint Chiefs of Staff to plan a war. I want you to hold a press conference in Washington, D.C., and announce their plan and say to the world that you got the information from me, Elijah Muhammad, on the Wheel." During that same press conference Farrakhan stated that he believed his "experience" was proven, stating, "In 1987, in the New York Times' Sunday magazine and on the front page of the Atlanta Constitution, the truth of my vision was verified, for the headlines of the Atlanta Constitution read, "President Reagan Planned War Against Libya." He continued, "In the article which followed, the exact words that the Honorable Elijah Muhammad spoke to me on the Wheel were found; that the President had met with the Joint Chiefs of Staff and planned a war against Libya in the early part of September 1985." On January 12, 1995, Malcolm X's daughter Qubilah Shabazz was arrested for conspiracy to assassinate Farrakhan. According to Stanford University historian Clayborne Carson, "[her family] resented Farrakhan and had good reason to because he was one of those in the Nation responsible for the climate of vilification that resulted in Malcolm X's assassination". Some critics later alleged that the FBI had used paid informant Michael Fitzpatrick to frame Shabazz, who was four years old when her father was killed. Nearly four months later, on May 1, Shabazz accepted a plea agreement under which she maintained her innocence but accepted responsibility for her actions. That year in October, Farrakhan convened a broad coalition of what he and his supporters claim to have been one million men in Washington, D.C., for the Million Man March. The count however fell far below the hoped-for numbers. The National Park Service estimated that approximately 440,000 were in attendance. Farrakhan threatened to sue the National Park Service because of the low estimate from the Park Police. Farrakhan and other speakers called for black men to renew their commitments to their families and communities. In Farrakhan's 2​1⁄2 hours he quoted from spirituals as well as the Old and New Testaments and termed himself a prophet sent by God to show America its evil. The event was organized by many civil rights and religious organizations and drew men and their sons from across the United States of America. Many other distinguished African Americans addressed the throng, including: Maya Angelou; Rosa Parks; Martin Luther King III, Cornel West, Jesse Jackson and Benjamin Chavis. In 2005, together with other prominent African Americans such as the New Black Panther Party leader Malik Zulu Shabazz, the activist Al Sharpton, Addis Daniel and others, Farrakhan marked the 10th anniversary of the Million Man March by holding a second gathering, the Millions More Movement, October 14–17 in Washington D.C.
2005, a Black Entertainment Television (BET) poll voted Farrakhan the 'Person of the Year'. 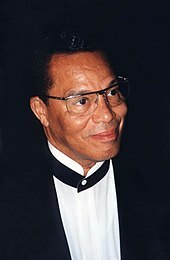 2006, an AP-AOL "Black Voices" poll voted Farrakhan the fifth-most important black leader, with 4 percent of the vote. In comments in 2005, Farrakhan stated that there was a 25-foot (7.6 m) hole under one of the key levees that failed in New Orleans following Hurricane Katrina. He implied that the levee's destruction was a deliberate attempt to wipe out the population of the largely black sections within the city. Farrakhan later said that New Orleans Mayor Ray Nagin told him of the crater during a meeting in Dallas, Texas. Farrakhan further claimed that the fact the levee broke the day after Hurricane Katrina is proof that the destruction of the levee was not a natural occurrence. Farrakhan has raised additional questions and has called for federal investigations into the source of the levee break. He also asserted that the hurricane was "God's way of punishing America for its warmongering and racism". Experts including the Independent Levee Investigation Team (ILIT) from the University of California, Berkeley have countered his accusations. The report from the ILIT said "The findings of this panel are that the over-topping of the levees by flood waters, the often sub-standard materials used to shore up the levees, and the age of the levees contributed to these scour holes found at many of the sites of levee breaks after the hurricane." In 2008, Farrakhan publicly criticized the United States and supported then-Senator Barack Obama who was campaigning at the time to become the president of the United States of America. Farrakhan and Obama had met at least once before. The Obama campaign quickly responded to convey his distance from the minister. "Senator Obama has been clear in his objections to Farrakhan's past pronouncements and has not solicited the minister's support," said Obama spokesman Bill Burton. Obama "rejected and denounced" Farrakhan's support during an NBC presidential candidate debate. Following the 2008 presidential election, Farrakhan explained, during a BET television interview, that he was "careful" never to endorse Obama during his campaign. "I talked about him—but, in very beautiful and glowing terms, stopping short of endorsing him. And unfortunately, or fortunately, however we look at it, the media said I 'endorsed' him, so he renounced my so-called endorsement and support. But that didn't stop me from supporting him." By 2011, Farrakhan was no longer supporting Obama, whom he called the "first Jewish president", due to Obama's support for the 2011 military intervention in Libya, which Farrakhan strongly opposed due to his own support for Muammar Gaddafi. At a March 31, 2011 press conference held at the Mosque Maryam, Farrakhan warned that the United States could be "facing a major earthquake as part of God's divine judgment against the country for her evil". On May 28, 2011, Farrakhan, speaking at the American Clergy Leadership Conference, lambasted Obama over the wars in Iraq and Afghanistan and the Libya intervention, calling him an "assassin" and a "murderer." "We voted for our brother Barack, a beautiful human being with a sweet heart," Farrakhan said, in a video making the rounds on the internet. But he has turned into someone else, Farrakhan told the crowd. "Now he's an assassin." Farrakhan, a critic of military interventionism overseas, was strongly opposed to Obama's proposal to intervene in Syria in 2013. On May 8, 2010, Farrakhan publicly announced his embrace of Dianetics and has actively encouraged Nation of Islam members to undergo auditing from the Church of Scientology. Although he has stressed that he is not a Scientologist, but only a believer in Dianetics and the theories related to it, the Church honored Farrakhan previously during its 2006 Ebony Awakening awards ceremony (which he did not attend). Farrakhan has also urged European Americans to join the Church of Scientology, stating, "All white people should flock to [Scientology founder] L. Ron Hubbard. You can still be a Christian; you just won't be a devil Christian. You can still be a Jew, but you won't be a satanic Jew." Farrakhan has been the center of much controversy with critics saying that his political views and comments are antisemitic or racist. Farrakhan has categorically denied these charges and stated that much of America's perception of him has been shaped by media. We don't give a damn about no white man law if you attack what we love. And frankly, it ain't none of your business. What do you got to say about it? Did you teach Malcolm? Did you make Malcolm? Did you clean up Malcolm? Did you put Malcolm out before the world? Was Malcolm your traitor or ours? And if we dealt with him like a nation deals with a traitor, what the hell business is it of yours? You just shut your mouth, and stay out of it. Because in the future, we gonna become a nation. And a nation gotta be able to deal with traitors and cutthroats and turncoats. The white man deals with his. The Jews deal with theirs. During a 1994 interview, Gabe Pressman asked Shabazz whether Farrakhan "had anything to do" with Malcolm X's death. She replied: "Of course, yes. Nobody kept it a secret. It was a badge of honor. Everybody talked about it, yes." In January 1995, Qubilah Shabazz, the daughter of Malcolm X and Betty Shabazz, was charged with trying to hire an assassin to kill Farrakhan in retaliation for the murder of her father, for which she believed he was responsible. In a 60 Minutes interview that aired during May 2000, Farrakhan stated that some of the things he said may have led to the assassination of Malcolm X. "I may have been complicit in words that I spoke", he said. "I acknowledge that and regret that any word that I have said caused the loss of life of a human being." A few days later Farrakhan denied that he "ordered the assassination" of Malcolm X, although he again acknowledged that he "created the atmosphere that ultimately led to Malcolm X's assassination." Farrakhan has made many comments that have been deemed antisemitic by the Anti-Defamation League and others. In 2012, the Simon Wiesenthal Center included some of Farrakhan's comments on its list of the Top 10 antisemitic slurs of that year. At a meeting of the Nation of Islam at Madison Square Garden in 1985, Farrakhan said of the Jews: "And don't you forget, when it's God who puts you in the ovens, it's forever!" Farrakhan made antisemitic comments during his May 16–17, 2013 visit to Detroit and in his weekly sermons titled "The Time and What Must Be Done", begun during January 2013. In March 2015, Farrakhan accused Jews of involvement in the September 11 attacks. In his Saviours' Day speech in February 2018, Farrakhan described "the powerful Jews" as his enemy and cited President Richard Nixon and the Reverend Billy Graham approvingly, quoting them as blaming Jews for "all of this filth and degenerate behavior that Hollywood is putting out". On March 23, 2002, Farrakhan visited Kahal Kadosh Shaare Shalom in Kingston, Jamaica, which was his first visit to a synagogue, in an attempt to repair his controversial relationship with the Jewish community. Farrakhan was accepted to speak at Shaare Shalom in the native country of his father, after being rejected to appear at American synagogues, many of whom had fear of sending the wrong signal to the Jewish community. Toward the end of that portion of his speech that was recorded, Mr. Farrakhan said: "Now that nation called Israel never has had any peace in 40 years and she will never have any peace because there can be no peace structured on injustice, thievery, lying and deceit and using the name of God to shield your dirty religion under His holy and righteous name. As a Muslim, I revere Abraham, Moses, and all the Prophets whom Allah (God) sent to the children of Israel. I believe in the scriptures brought by these Prophets and the Laws of Allah (God) as expressed in the Torah. I would never refer to the Revealed Word of Allah (God)—the basis of Jewish Faith—as 'dirty' or 'gutter.' You know, Jude, as well as I, that the Revealed Word of Allah (God) comes as a Message from Allah (God) to purify us from our evil that has divided us and caused us to fall into the gutter. Over the centuries, the evils of Christians, Jews and Muslims have dirtied their respective religions. True Faith in the laws and Teaching of Abraham, Jesus and Muhammad is not dirty, but, practices in the name of these religions can be unclean and can cause people to look upon the misrepresented religion as being unclean. In response to Farrakhan's speech, Nathan Pearlmutter, then Chair of the Anti-Defamation League (ADL) of B'nai B'rith, referred to Farrakhan as the new "Black Hitler" and Village Voice journalist Nat Hentoff also characterized the NOI leader as a "Black Hitler" while a guest on a New York radio talk-show. So I said to the members of the press, 'Why won't you go and look into what we are saying about the threats on Reverend Jackson's life?' Here the Jews don't like Farrakhan and so they call me 'Hitler'. Well that's a good name. Hitler was a very great man. He wasn't great for me as a Black man but he was a great German and he rose Germany up from the ashes of her defeat by the united force of all of Europe and America after the First World War. Yet Hitler took Germany from the ashes and rose her up and made her the greatest fighting machine of the twentieth century, brothers and sisters, and even though Europe and America had deciphered the code that Hitler was using to speak to his chiefs of staff, they still had trouble defeating Hitler even after knowing his plans in advance. Now I'm not proud of Hitler's evil toward Jewish people, but that's a matter of record. He rose Germany up from nothing. Well, in a sense you could say there is a similarity in that we are rising our people up from nothing, but don't compare me with your wicked killers. Farrakhan announced that he was seriously ill in a letter on September 11, 2006 that was directed to his staff, Nation of Islam members, and supporters. The letter, published in The Final Call newspaper, said that doctors in Cuba had discovered a peptic ulcer. According to the letter subsequent infections caused Farrakhan to lose 35 pounds (16 kg), and he urged the Nation of Islam leadership to carry on while he recovered. Farrakhan was released from his five-week hospital stay on January 28, 2007, after major abdominal surgery. The operation was performed to correct damage caused by side effects of a radioactive "seed" implantation procedure that he received years earlier to successfully treat prostate cancer. Following his hospital stay, Farrakhan released a "Message of Appreciation" to supporters and well-wishers and weeks later delivered the keynote address at the Nation of Islam's annual convention in Detroit. In December 2013, Farrakhan announced that he had not appeared publicly for two months because he had suffered a heart attack in October. When Farrakhan first joined the NOI, he was asked by Elijah Muhammad to put aside his musical career as a calypso singer. After 42 years, Farrakhan decided to take up the violin once more primarily due to the urging of prominent classical musician Sylvia Olden Lee. On April 17, 1993, Farrakhan made his return concert debut with performances of the Violin Concerto in E Minor by Felix Mendelssohn. Farrakhan intimated that his performance of a concerto by a Jewish composer was, in part, an effort to heal a rift between him and the Jewish community. The New York Times music critic Bernard Holland reported that Farrakhan's performance was somewhat flawed due to years of neglect, but "nonetheless Mr. Farrakhan's sound is that of the authentic player. It is wide, deep and full of the energy that makes the violin gleam." ^ a b "Louis Farrakhan Fast Facts". CNN. May 22, 2015. Retrieved August 13, 2015. ^ a b "Louis Farrakhan". Splcenter.org. Retrieved 16 November 2014. ^ Gray, Briahna Joy (2018-03-13). "On the Dangers of Following Louis Farrakhan". Rolling Stone. Retrieved 2018-12-01. ^ "Letter of warning to President George Bush: December 1, 2001". NOI.org - The Nation of Islam Official Website. Retrieved 16 November 2014. ^ "Nation of Islam at a Crossroad as Leader Exits". The New York Times. Retrieved 16 November 2014. ^ "Louis Farrakhan's 52 Weeks Of Hate". Anti-Defamation League. Retrieved 24 October 2013. ^ "Farrakhan In His Own Words". Anti-Defamation League. Retrieved 24 October 2013. ^ a b c d Mattias Gardell, In the Name of Elijah Muhammad: Louis Farrakhan and The Nation of Islam Duke University Press, 1996, p.119. ^ Gates Jr., Henry Louis (April 29, 1996). "The Charmer". The New Yorker. pp. 116–121. Retrieved March 10, 2018. ^ John B. Judis, "Maximum Leader", The New York Times, August 18, 1996, Accessed on May 19, 2006. ^ "The New York Times". Query.nytimes.com. 19 April 1993. Retrieved 16 November 2014. ^ Company, Johnson Publishing (5 March 2007). "Jet". Johnson Publishing Company – via Google Books. ^ "LOUIS FARRAKHAN, CALYPSO CHARMER". Washington Post. 1995-10-14. ISSN 0190-8286. Retrieved 2018-12-16. ^ Lincoln, C. Eric (1994). The Black Muslims in America. Wm. B. Eerdmans Publishing Co. ISBN 978-0-8028-0703-8. ^ Newman, Andy (March 19, 2010). "Killer of Malcolm X Is Granted Parole". The New York Times. Retrieved July 3, 2013. ^ Terry, Don. "W. DEEN MOHAMMED: A leap of faith". chicagotribune.com. Retrieved 2018-12-16. ^ "Reform Jewish Movement Mourns Imam W.D. Mohammed, an Advocate for Peace". Religious Action Center. 2014-09-03. Retrieved 2018-12-16. ^ Malcolm X (1964). The Autobiography of Malcolm X. The Random House Publishing Group. ISBN 978-0-345-37671-8. ^ "Farrakhan continues Hon. Elijah Muhammad's mission". Finalcall.com. Retrieved 16 November 2014. ^ Worthington, Rogers (October 28, 1985). "Farrakhan Stand Bad For Business". Chicago Tribune. Retrieved March 14, 2017. ^ Wilkerson, Isabel (1995-01-16). "Farrakhan Case Informer: A Man Living on the Edge". The New York Times. ISSN 0362-4331. Retrieved 2018-12-16. ^ "Dr. Betty Shabazz, Minister Farrakhan Mend 30-Year Rift During Fund-Raiser". Jet. May 22, 1995. pp. 12–13. Retrieved May 26, 2018. ^ "The 3 to 5 Million Man March". ^ Janofsky, Michael (1995-11-21). "Federal Parks Chief Calls 'Million Man' Count Low". The New York Times. Retrieved 2011-09-14. ^ Wilgoren, Debbi (October 22, 1995). "Farrakhan's Speech: Masons, Mysticism, More". The Washington Post. Retrieved November 30, 2018. ^ "Millions More March Draws Black Activists". NPR.org. Retrieved 2018-12-16. ^ "A more conciliatory Farrakhan: 'I've evolved'". CNN. March 26, 2008. Archived from the original on December 1, 2010. Retrieved July 8, 2011. ^ "Poll: Jesse Jackson, Rice Top Blacks". CBS News. February 15, 2006. ^ "Politics Mondays: The Intentional Destruction Of Levees in New Orleans – A Conspiracy Theory? Not In The Light Of History". Blackelectorate.com. Retrieved 16 November 2014. ^ Michael Eric Dyson, Come Hell or High Water: Hurricane Katrina and the Color of Disaster (2006), pp. 178-202. ISBN 0-465-01761-4. ^ Independent Levee Investigation Team at UC Berkeley (July 31, 2006). "Independent Levee Investigation Team Final Report – Chapter 7: The New Orleans East Protected Area" (PDF). University of California, Berkeley. pp. 1–30. Archived from the original (PDF) on September 6, 2006. Retrieved December 12, 2006. ^ a b Margaret Ramirez and Mike Dorning, "Farrakhan sings Obama's praises; Senator has criticized him, says support not sought", Chicago Tribune, February 25, 2008. Retrieved December 14, 2016. ^ Muhammad, Askia (March 5, 2008). "Farrakhan addresses world at Saviours' Day 2008". The Final Call. Retrieved December 14, 2016. ^ Cunningham, Vinson (January 28, 2018). "The Politics of Race and the Photo That Might Have Derailed Obama". The New Yorker. Retrieved February 3, 2018. ^ Edney, Hazel Trice (January 20, 2018). "Photo of Sen. Barack Obama with Farrakhan Surfaces". NorthStar News Today. Retrieved February 6, 2018. ^ "BET Interview with Minister Louis Farrakhan, Posted date: February 6, 2009". Finalcallmedia.com. Retrieved 16 November 2014. ^ "Louis Farrakhan defends "brother" Gaddafi; blasts U.S. action in Libya". International Business Times. 31 March 2011. Retrieved 16 November 2014. ^ "Louis Farrakhan Press Conference, Mosque Maryam, March 31, 2011". Moiatlanta.org. Archived from the original on 29 November 2014. Retrieved 16 November 2014. ^ "Louis Farrakhan: Obama Is A 'Murderer,' An 'Assassin'". 21 June 2011 – via Huff Post. ^ "Weapons Attacks In Syria And A Warning To The Warmongers". www.finalcall.com. ^ "Farrakhan Slams Possible US Intervention In Syria [VIDEO]". 2 September 2013. ^ a b Gray, Eliza (October 5, 2012). "The Mothership of All Alliances". The New Republic. Retrieved November 19, 2012. ^ Mohammed, Asahed (February 28, 2013). "Nation of Islam Auditors graduation held for third Saviours' Day in a row". Final Call. Retrieved April 22, 2012. ^ Bierbauer, Charles (October 17, 1995). "Million Man March: Its goal more widely accepted than its leader". CNN. ^ Gardell, Mattias (1996). In the Name of Elijah Mohammed: Louis Farrakhan and The Nation of Islam. Duke University Press. ISBN 978-0-8223-1845-3. ^ Rickford, Russell J. (2003). Betty Shabazz: A Remarkable Story of Survival and Faith Before and After Malcolm X. Naperville, Ill.: Sourcebooks. pp. 437, 492–495. ISBN 978-1-4022-0171-4. ^ Evanzz, Karl (1992). The Judas Factor: The Plot to Kill Malcolm X. New York: Thunder's Mouth Press. pp. 298–299. ISBN 978-1-56025-049-4. ^ Kondo, Zak A. (1993). Conspiracys: Unravelling the Assassination of Malcolm X. Washington, D.C.: Nubia Press. pp. 182–183, 193–194. OCLC 28837295. ^ Marable, Manning (2011). Malcolm X: A Life of Reinvention. New York: Viking. p. 305. ISBN 978-0-670-02220-5. ^ Rickford, pp. 436–439, 492–495. ^ Wartofsky, Alona (February 17, 1995). "'Brother Minister: The Martyrdom of Malcolm X'". The Washington Post. Retrieved August 1, 2008. ^ "Farrakhan on Malcolm X's Assassination, 1993". YouTube.com. ^ "Widow of Malcolm X Suspects Farrakhan Had Role in Killing". The New York Times. The New York Times Company. March 13, 1994. Retrieved June 11, 2010. ^ "Malcolm X's Daughter Indicted in Alleged Plot to Kill Louis Farrakhan". Jet. Johnson Publishing Company: 6–10. January 30, 1995. Retrieved June 11, 2010. ^ Shelman, Jeffrey (May 1, 1995). "Charges Dropped Against Shabazz -- Deal Reached In Murder-Plot Case". The Seattle Times. Retrieved August 29, 2012. ^ "Farrakhan Admission on Malcolm X". 60 Minutes. CBS News. May 14, 2000. Retrieved August 2, 2008. ^ "Farrakhan Responds to Media Attacks". The Final Call. May 15, 2000. Retrieved August 2, 2008. ^ a b "Nation of Islam". Southern Poverty Law Centre. Retrieved November 30, 2018. ^ Greenblatt, Jonathan A. (October 8, 2015). "Louis Farrakhan's pleas for justice are blunted by bigotry and calls to violence". The Washington Post. Retrieved November 30, 2018. ^ "Farrakhan In His Own Words" (PDF). The Anti-Defamation League. March 20, 2015. Retrieved September 3, 2018. ^ "Farrakhan on Jews". Adl.org. Archived from the original on April 11, 2010. Retrieved May 19, 2010. ^ "2012 Top Ten Anti-Semitic/Anti-Israel Slurs" (PDF). Simon Wiesenthal Center. Retrieved January 4, 2013. ^ Hitchens, Christopher (2007). God Is Not Great. London: Atlantic Books. p. 219. ISBN 9781843545743. ^ "Detroit Religious Leaders Praise Farrakhan After Latest Anti-Semitic Outburst". ADL. ^ "Louis Farrakhan's 52 Weeks Of Hate". ADL. ^ Chasmar, Jessica (March 5, 2015). "Louis Farrakhan: 'Israelis and Zionist Jews' played key roles in 9/11 attacks". The Washington Times. Retrieved March 31, 2015. ^ Tatum, Sophie (March 1, 2018). "Nation of Islam leader Farrakhan delivers anti-Semitic speech". CNN. Retrieved March 2, 2018. ^ Farrakhan Continues His Anti-Semitic Saviours' Day Message in Chicago. Anti-Defamation League. Retrieved May 5, 2018. ^ a b "Louis Farrakhan's first visit to a Jewish Synagogue... 'It took courage to bring me here'" Archived 2010-10-16 at the Wayback Machine, Jamaica Gleaner, 26 March 2002. ^ Shipp, E. R. (June 29, 1984). "Tape Contradicts Disavowal of 'Gutter Religion' Attack". The New York Times. pp. A12. ^ a b "Minister Farrakhan rebuts fraudulent "Judaism is a Gutter Religion" canard". NOI.org - The Nation of Islam Official Website. Retrieved 16 November 2014. ^ "Memos on the Margin-971222 Letter from Louis Farrakhan". Polyconomics.com. Retrieved 16 November 2014. ^ a b c "Facing Complaints of Bias, Farrakhan Speaks to Women Only". The New York Times. July 31, 1994. ^ "NOI Statements, 2007". Noi.org. Archived from the original on 28 August 2013. Retrieved 16 November 2014. ^ "Farrakhan 2007 NOI Convention Webcast, February 25, 2007". Sd2007.com. Archived from the original on 5 April 2013. Retrieved 16 November 2014. ^ "In First Appearance After Heart Attack, Farrakhan Continues Anti-Semitism". Anti-Defamation League. Retrieved 6 December 2013. ^ a b Holland, Bernard (April 19, 1993). "Sending a Message, Louis Farrakhan Plays Mendelssohn". The New York Times. Mr. Farrakhan acknowledged the symbolism in his playing of music by a European Jew...Speaking in a quiet but insistent voice, he said he would "try to do with music what cannot be done with words and try to undo with music what words have done." Muhammad, Jabril (2006). Closing The Gap: Inner Views of the Heart, Mind & Soul of the Honorable Minister Louis Farrakhan. FCN Publishing Co. ISBN 978-1-929594-99-3. Gardell, Mattias (1996). In the Name of Elijah Mohammed: Louis Farrakhan and The Nation of Islam. Duke University Press. ISBN 978-0-8223-1845-3. Farrakhan, Louis (1993). A Torchlight for America. FCN Publishing Co. ISBN 0-9637642-4-1. Islam or Farrakhanism: What Does the Nation of Islam Believe? This page was last edited on 21 April 2019, at 10:43 (UTC).